Through our Character and Ethics development program, children learn to work in a group setting and develop social skills including respect, patience, and independence. 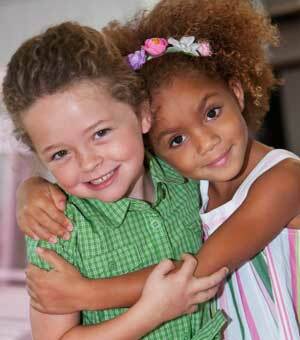 Throughout the year, children are encouraged to respect themselves and their community. We provide our children with a multitude of opportunities to share their spirit of giving and kindness, and put thoughtfulness into practice. One of the ways we do this is through our “Fostering Friendships” program. This is where we encourage classrooms to do kind deeds for other Imagination Island classrooms. Every month each of our classrooms will be giving to others in some form, which could be a piece of art for another classroom to display, reading books to younger children, writing notes or cards, or preparing a special snack or treat. We encourage children to take their time and put forth their best effort to do something selfless for others. We encourage the children to help out at home. Through roll play and continuous examples and ideas to try at home we hope to see children thinking of others and helping their brothers and sisters and mommies and daddies. We hope to saturate them with thoughts of putting others first and that families begin to experience the fruits of those labors at home. Our curriculum incorporates “Mission Mindedness” and throughout the year we will have different missions that the children will be exposed to as they are given opportunities to contribute to charities. Operation Christmas Child, partnering with the Humane Society, Trike-A-Thons to raise money for children’s causes, and Jump Rope for Heart are some causes of interest where we will help children understand needs of other children and learn about the different ways they can help. We will be a daily presence at our school. As Imagination Island of Fleming Island sets sail and embarks on an educational journey with the children of our community, we are committed to overseeing each detail of your child’s education. Our extensive curriculum will prepare your children to enter Kindergarten with a strong foundation of knowledge and readiness to learn, read and succeed in school. Our Education Director, Lisa Greene, has a Masters Degree in Educational Leadership and over 20 years of experience in Early Childhood Education. She has most recently been a cornerstone in the planning and establishment of a successful, nationally recognized Early Childhood Development School here in Jacksonville and served as Education Director there for several years before leaving to fulfill her dream of opening her own school here in Fleming Island. We are excited to meet you and your children! We look forward to partnering with the parents of Fleming Island to help bring out the very best in each child. 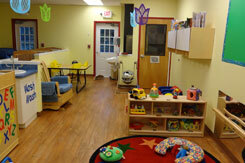 Infants at Imagination Island love to play with toys in front of the mirror, with a separate area for individual cribs. Toddlers have their own supervised play area, and we also provide additional supervised play activities to enhance group learning. 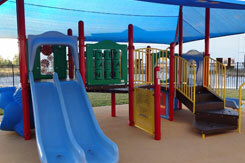 This larger play area includes areas for climbing, learning and sliding. 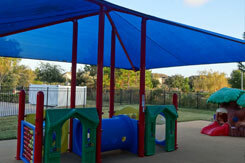 Supervised outside play is customized for each age group. 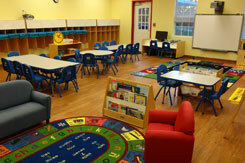 Our spacious rooms include plenty of areas for whole and small group learning, and tables for several learning stations. Call 904-264-5565 or submit your question below & we'll get right back to you!